From our stock you can buy new and high quality PLASTO PVC windows. The windows remain from the production of Norges Hus prefabricated houses. 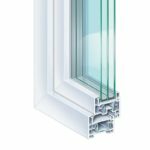 They are triple glazed, thermal resistant, new and have an affordable price. A cost-effective profile system Kömmerling76AD is used in the production of windows, which achieves a first-class thermal resistance coefficient of up to 0.9 W / m2k. We offer production remains, new dimentions are not available.